This is the technical specification for the core module named "Listing". This component will be part of Contrexx 3.1. Listing provides an easy to use way to perform paging, sorting and filtering. Listing is optimized to work with Doctrine, but should be able to handle any sort of data that can be paged, sorted and filtered from the view. 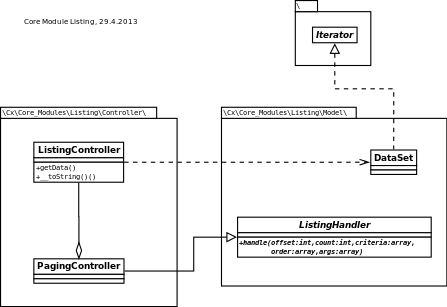 Listing controller can be initialized in two ways. Either provide a doctrine entity class name or a callback function for the parameter $entities. The callback function returns an instance of doctrine query (\Doctrine\ORM\Query) or an instance of \Cx\Core_Modules\Listing\DataSet. If a dataset is returned, you will have to make use of $offset, $count, $criteria and $order. This page was last edited on 7 May 2013, at 05:31.